Brotherhood Sound is responsible for keeping this event's information up to date. This page has been viewed 714 time(s). Sensational, youthful Jamaican singer ABIJAH backed by Boston's Dub Station Band & supported by the Southwest's tuffist reggae sound BROTHERHOOD. 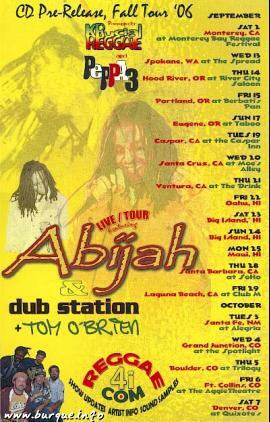 Link us for ABIJAH specials/dubplates !!! © copyright 1993-2007 by fearstudios.com ( 186313108+141ms ). All Rights Reserved. Report a bug or make a suggestion.